There are a couple of main principles to storage espoused in The Life-Changing Magic of Tidying Up: Store only after all disposal is done. Stack vertically instead of horizontally. Don’t keep things tucked away in places you’ll never see or pull out. Store all stuff of a kind in a single location. Don’t bother with fancy storage solutions. Keep things simple, to make it easier to grab things and put them away. Make sure every single possession has a specific place it belongs. Some of these rules were easier than others. For many reasons, it’s necessary in our house to have multiple locations for similar items, for example. Wherever I could, though, I attempted to follow these rules, with some fantastic results. My closet shelf has now become my little place for sentimental books, journals, magazines, yearbooks, memorabilia, etc. I can see it all at a glance, instead of having it all tucked away in a trunk. My exercise equipment is on the floor next to my shoes, and (not visible here) my bags are up on hangers. In the future, I will add shelf space to my bedroom wall for stuffed-animal-and-Pony kinds of keepsakes. In my bathroom, I have a shelf that keeps all my cosmetics and toiletries organized. Under my sink, there are now two bins – one for cleaning supplies, one for the small stock of extra bathroom stuff and medicines. Vertical storage ended up bringing me a lot of happiness in silly ways. 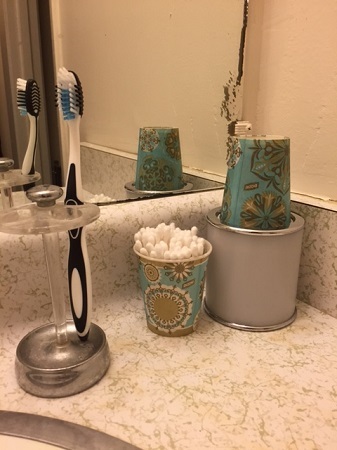 For example, instead of keeping my cotton swabs in their bulk box on my counter, the box is now in my overstock bin under the sink, and I have a Dixie-cup full of swabs to keep on the counter! Much neater and certainly prettier, haha! Kondo recommends using square/rectangular storage rather than circular or odd-shaped boxes. She also says that if an odd-shaped box brings you joy in and of itself, go ahead and use it. 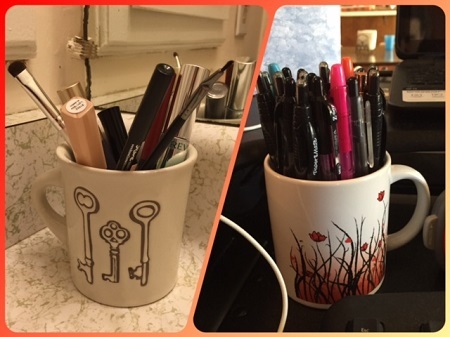 Well, this isn’t a box, but I have a few coffee mugs I love but don’t actually use (too small!). One is now holding all my pens on my desk; another all my long-tube makeup and makeup brushes in my bathroom. Yes!! The drawers I got rid of ended up holding all our DVDs and CDs. Unfortunately, this left my bookshelves particularly bare (the third, not pictured, is empty except for the boys’ library books! 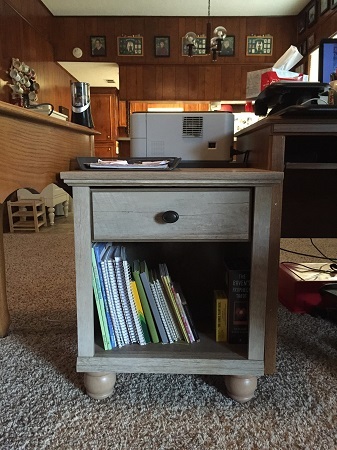 ), and the drawers are not great for these heavier items. 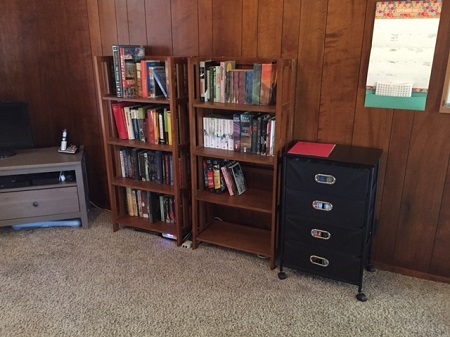 Honestly, I’d really like to replace the entire shelving and entertainment area at some point. Kristen’s shelves bring me particular joy just looking at them, and I can imagine something similar in my living room. One day. Which brings me to lessons learned on this Great Tidy-My-Life Project adventure. But! That’s a topic for next week! To wrap up today’s storage post, let me just say one thing. After I’d finished putting this all together, Jason was looking for the checkbook one morning. He thought I had it, because he last remembered giving it to me. I remembered giving it back, but he didn’t. I thought I might as well go through my stuff, just in case I’d left it in my desk drawer or purse. Except…everything has a place. I take everything out of my purse now. I can see everything in my desk drawer and I know the things in there. It only took a quick mental sweep to realize there was no point to me searching. I knew I didn’t have it. And I didn’t – we found it later with Jason’s stuff. The point is: I knew exactly where all my stuff was. Without having to look. And that is an awesome feeling. This entry was posted in Book Talk, Wellness and tagged KonMari. Bookmark the permalink. I really am finding that the more everything has a specific place rather than a general place, the easier it is for things to stay tidy. Sure, the boys leave stuff all over the living room floor, but mostly I just grab up their stuff and toss it into their rooms to clean up after school. And I’m not resentful about it anymore either. Sure, I’ll tell them to pick up their stuff if they’re home, but it only takes me a few moments to clear up when I’m alone during the day, and that’s nice. I feel far more relaxed. Probably even more so when I finish round 2. I am running the Book Blog awards this year for the 2nd year in a row and wanted to let you know nominations are open until October 31st . There are 15 awards up for grabs this year. You may nominate your own blog or ask your readers to nominate you. Readers vote on November 15th. 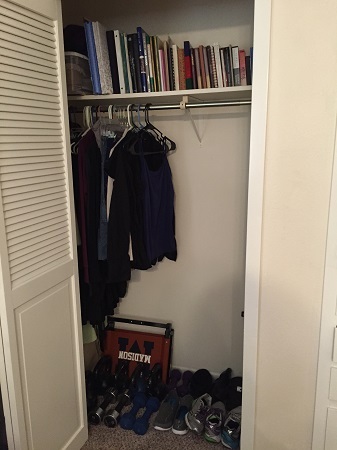 The storage is the part I still haven’t mastered, probably because I can’t call the purge done; the folding made my drawers look amazing, but the closet situation really needs to be revised. I haven’t *fully* mastered it yet either, because I’m still in the process of doing second-round culling, but it’s really far better than it used to be! Except the garage, which I still haven’t gotten to. This round! Aww, thank you for complimenting my shelves! They definitely bring me joy (and allow me to see the books that bring me joy as well!). I finally got my library hold of Kondo’s book so I’ll probably start reading it next week — though just from reading your posts, I already have some ideas about what needs to be done! I have loved watching your journey. Way to go, Amanda! That feeling of knowing where everything is without having to search or think about it is awesome, isn’t it? It’s amazing. Now if I could get everyone in the house to do the same, ha!